We store logs in decks during the Summer so we have enough wood to run the mill all year-long. Logging is curtailed in California during the Winter. 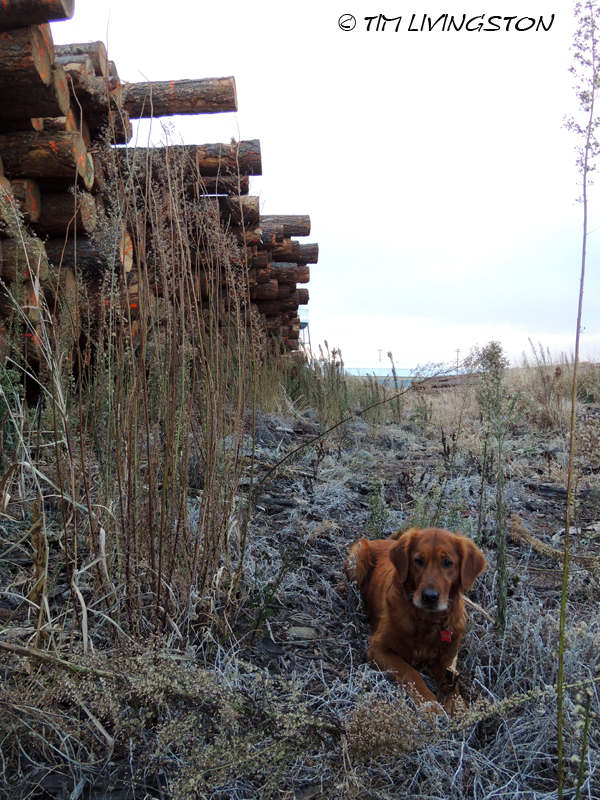 In the Winter logging is restricted to dry rainless periods or hard frozen conditions to avoid muddy runoff. 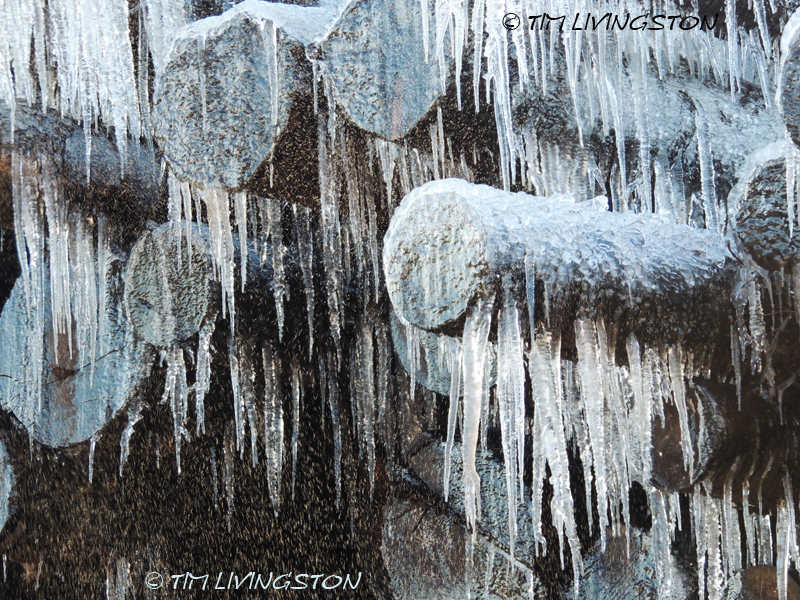 Frozen logs under the sprinklers…..logcicles! The log decks have sprinklers on top of them. This keeps the logs soaked, which keeps the wood in good condition until the logs are milled. We had a cold snap last week that got down into the teens. 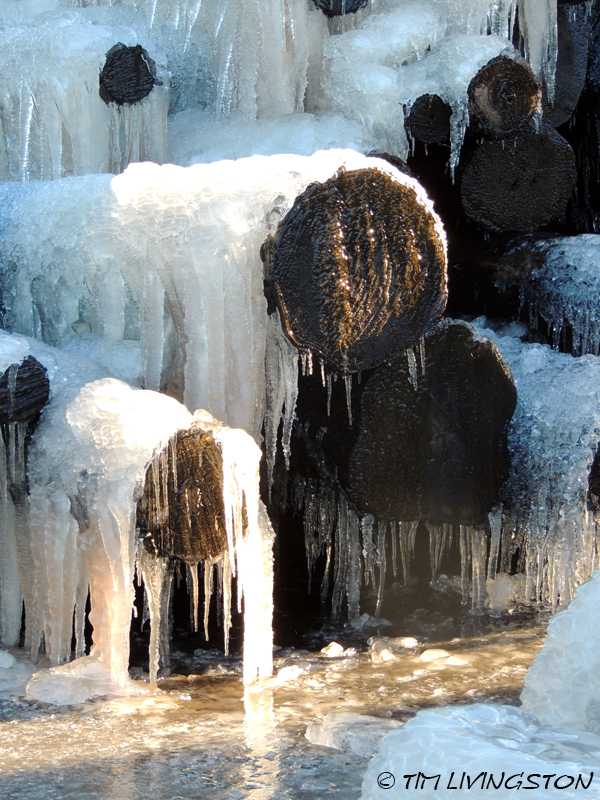 Irrigating the logs when it gets this cold creates quite an ice show. 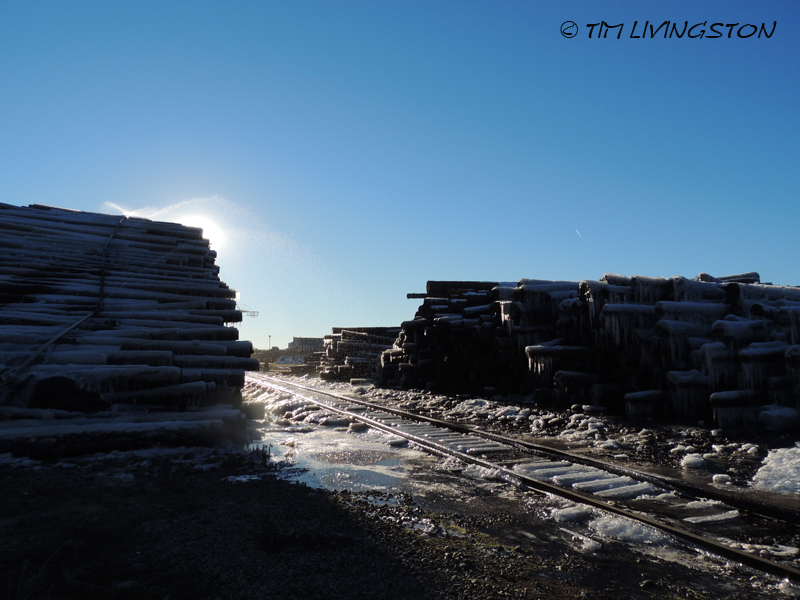 This big deck of logs is a wall of ice. Grass-cicles growing near the logs. Perfect for stirring that martini! They used to keep the logs wet in log ponds. Now the log ponds are our water supply for irrigating the logs and other mill needs. The local wildlife now make the old log ponds home. 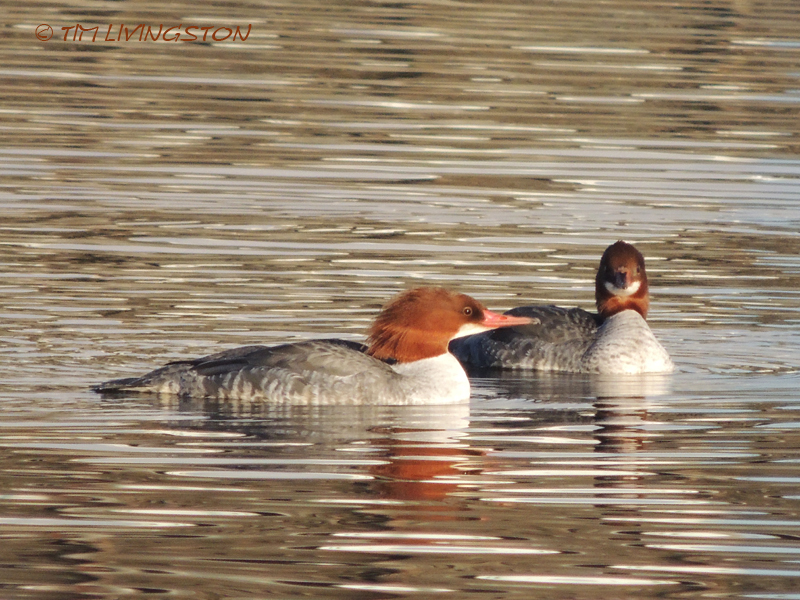 Common mergansers loving the log pond. This entry was posted in Forestry, Wildlife At The Mill and tagged Common merganser, Forester Artist, golden retriever, log deck, logs, merganser, sawmill by foresterartist. Bookmark the permalink. Nature can be crazy at times, and the on the other hand sometimes it can be just so goddamn beautiful! Yes indeed. Sometimes I think it’s the odd circumstances that create the most interesting sights. Your dog is adorable, by the way. Love the Merganser photo. Thank you Judy. I always check the pond to see who is around. This week it’s been mergansers, mallards, cormarants and egrets. This series is educational and fun. I really enjoy it! You could publish your own magazine or do you already do that? Thank you Linda. No magazine for me. I’d have to quit my day job! Interesting pics. And once again, saved by the Blitzer! How does wetting the logs “keep them in good shape”? Often or usually, “lumber” is dried before use. Interesting. If the logs dry out they will split or check open, and that results in a loss of wood volume. Value also decreases if the wood, particularly pine, is allowed to “blue stain”. Eventually, rot will set in and the wood will begin to break down. If the logs are kept wet these processes will be greatly delayed. It does result in lumber taking longer dry in the kilns because of the extra moisture in the wood. You dont get checking from the ice? That looks gnarly! No checking from the ice. As long as the logs are wet before the freeze the grain of the wood stays tight. We don’t allow them to dry out before processing them. That would reduce their value. Great title – that’s a lot of ice and I thought our 2″ inch ice storm last week was a lot, lol! I think your 2″ ice storm would kick our butts. We did get a few inches of snow. However, the ice in the pictures is all a result of our sprinklers running during the cold snap. It is impressive to us here in sunny California. I make pretty good Guacamole too! Blitz alway looks good, she’s my eye candy. That Blitz and her keen eye for those dangerous rabbits! 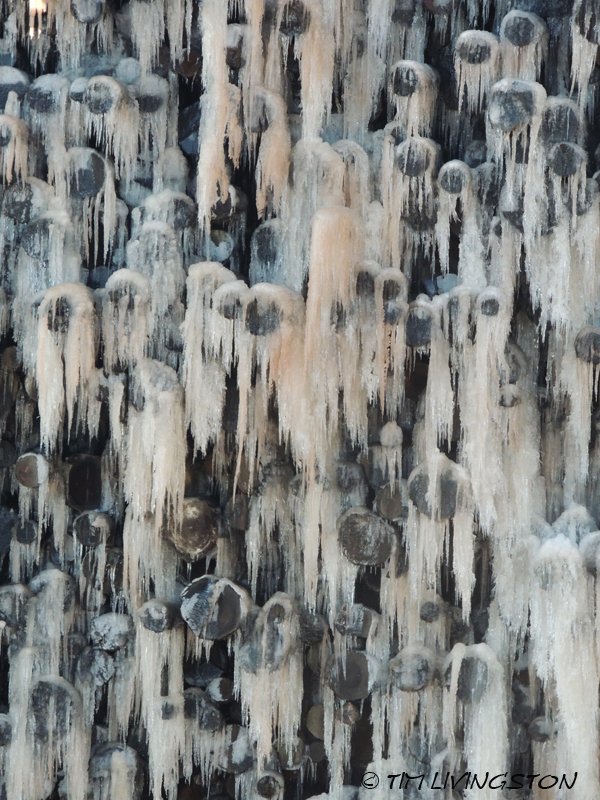 Quite the wall of ice – and so interesting in how trees are turned into building materials. What, I can’t believe you missed the frozen martini swizzler! I think you’re slipping. It must be exhaustion from all the holiday parties. OMG! Exhaustion combined with blonde brain = being off my game. Will never happen again. I hope! Love the little martini…how did you do that? Isn’t it cute? !🍸🍹🍷🍺🍻 These are on my smartphone keyboard. There are many. 🐻 The bear that almost ate you and 🐰 even the rabbit of Caerbannog! 🌴 This is the only tree I have tho. .. Gotta request them to add an oak or similar ☞ These look like MP hands! ☜ You can cut/paste them for your use if you’d like. Wow, you can do an entire post without saying a word! Indeed, and you probably don’t get many of these in Brazil! Hello!!! Of course not my friend!!! Here is summer breeze and a cold beer at the end of the day. You’re killing me! Okay, we are catching the next flight down. Oh! Dont forget … bring the sunblock, number 100!!!! Interesting pictures, especially the wascally wabbit watchdog. I have seen local sawmills run the same sprinkling system on cut logs here. When John was in timber framing, we didn’t have to deal with that. Our inventory was pretty much just what we needed for the house being cut. We sell some poles for log home construction and those are usually air dried. The logs that have yet to be peeled or sawn have to be watered if we are going to store them for more than a month. Great pictures Tim. Those logcicles are very impressive. Cute picture of Agent Blitz too. 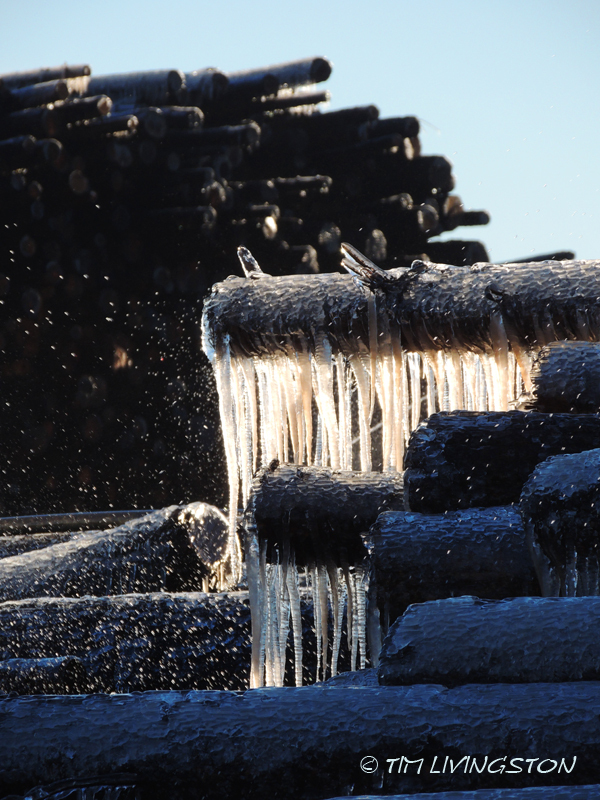 Whenever we get a severe cold spell the log deck freeze like that. It never gets old for me. I think it looks pretty cool. Although, not as cool as Blitz! Good Lord Helen, get on a plane and get up here right now! Our high last July was 116 F. We’ll be cool at least until May. It sounds like hot weather is the norm down under. Love to see this one but it don’t let me.. I think wordpress going a sleep on me.. It came up fine here…. I’ll check again shortly, I had problems with wordpress yet again. I think they’re picking on you! Thats what friends are for! but I still like you.. why did not you!!!!!!!!!! Don’t worry we are going to make our money else where..
We might have to sell one of our masterpieces! You go first. I don’t have a problem to do it but first I need to get a master piece.. Which museum should I break into? Come on now. You have a masterpiece or two inside you. I’m sure of it. The question is do I have the years to go with it to make grweat value.. It is always nice to see your smily face here on the list and I always ask what he is going to write… I’ll buy the book! Have a nice evening. Unfortunately, none of our art will be worth any real money until we are dead and gone. Just like Van Gogh! I might have to fake my own death, but I need to do a lot more art first to make it worth while. Do you think only having one will help? What making money yes I do.. Listening to the world… you might get used to it, don’t try it take my word for it. What a lovely post! 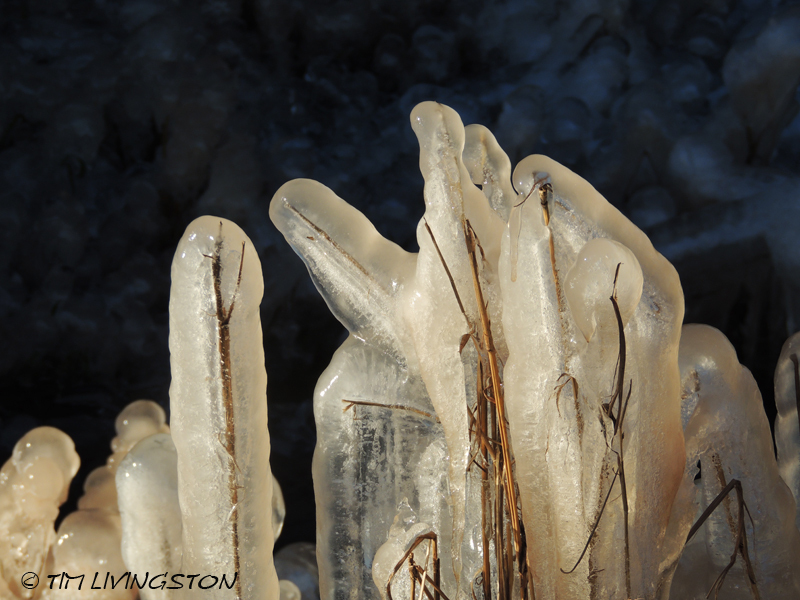 Such beautiful ice logs… amazing how thick the ice is. And I’d say: “Well done, Blitz – keep up the good work!” :-). Lost of pats and a big hug for the bravest dog around. Thank you Dina. Blitz always makes certain to get every pat and every hug that you send her way! I love these icy pictures! Your dog looks adorable, too. Thank you Jenny. Blitz is pretty adorable and she knows it! Very nicely done. I remember an old water tower that used to leak slowly which created beautiful icicles all the way to the ground. I wish I had a camera back then. It is gone now. Your logcicles are very arty. I love your dog too! Thank you LMG! I never get tired of seeing the logcicles. Blitz is my buddy. It’s nice to be able to bring her to work. Your two companions are beautiful!